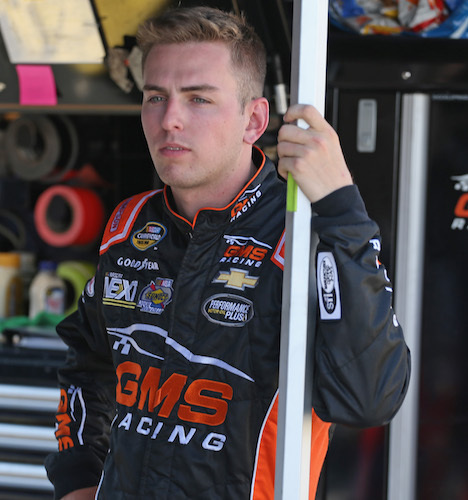 Dalton Sargeant no longer is the driver of the No. 25 GMS Racing Chevrolet in the NASCAR Camping World Truck Series. The driver and race team have parted ways with the entire seven-race Truck Series playoffs remaining. Sargeant, though, did not make the playoffs. Both driver and race team announced their parting of ways Wednesday. In the first 16 races of the 2018 Truck Series season, Sargeant posted one top-five, a third a Pocono Raceway in Long Pond, Pa., and four top-10 finishes. 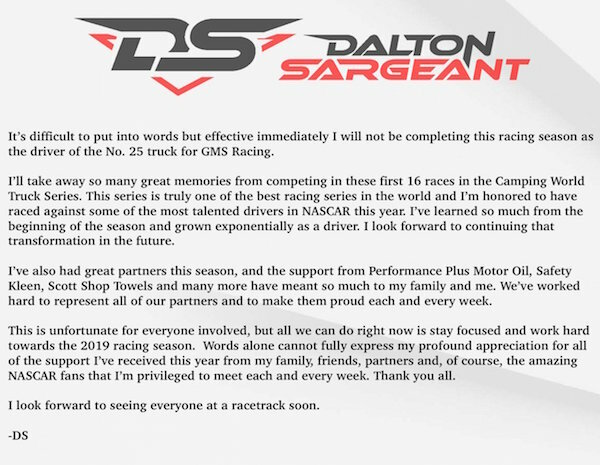 This season is Sargeant’s first full season in the Truck Series. Spencer Gallagher will replace Sargeant in the No. 25, for the time being. Gallagher began 2018 as the full-time driver of the No. 23 GMS Racing entry in the NASCAR Xfinity Series. This season was supposed to be Gallagher’s second full season in the Xfinity Series, but soon after claiming his first-career series win at Talladega (Ala.) Superspeedway, he was suspended indefinitely by NASCAR for violation of the sanctioning body’s substance abuse policy. He since has been reinstated but has raced sparingly. Gallagher raced full-time in the Truck Series in 2015 and 2016. His last race in the series was the 2017 season-opening race at Daytona (Fla.) International Speedway. In 59-career series starts, Gallagher has three top-fives and 15 top-10 finishes.